A general aviation facility, the Lawrence Municipal Airport is located approximately three miles north of Downtown Lawrence on East US Hwy 24/40. 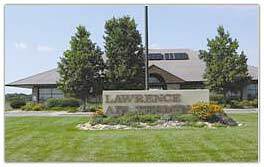 The city of Lawrence has owned and operated the airport at its current location since its dedication in October 1929. An uncontrolled airfield, LWC averages more than 100 daily flight operations of single-engine, twin-engine and business jets. With the assistance of a 5,700 feet runway and Class I Instrument Landing System, LWC is an outstanding all-weather airport for recreational or business flyers. A complete range of aviation services are available, including aircraft rental, flight instruction, hangar rental and a full-service Fixed Base Operator seven days a week from 8 a.m. to 8 p.m.
For information including radio frequencies and runway data, visit the Hetrick Air Services website.